Kill them yourself without making a bloody mess, simply follow this easy step by step guide. Were you bitten and think they might be from bed bugs? Look at these pictures and compare. 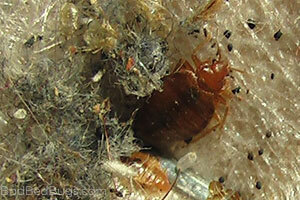 Link to: What Do Bed Bugs Look Like? Ever see a bed bug infestation? These images help you spot them and their nesting location. Either you’re concerned you’ve been bitten by a bed bug, think you found one, or looking to do your own pest control and prevention – no worries, we’ve got you covered! Visitors have been sharing their photos, success stories, and failures with us for more than a decade and we’ve summed it all up for you in an easy to understand format. BadBedBugs.com has been helping people deal with bedbugs since 2008 and is not affiliated with any pest control company. I strongly believe in using natural pesticides whenever possible and I’m all about doing it yourself, but please, read my tips before you start treatment; it’s not rocket science, but do it wrong, and you can end up with a nightmare! Think you found a bed bug or have been bitten by one? Send us a picture and we’ll take a look. We show you their hiding spots so you can check yourself and rest easy! If you are thinking of hiring an exterminator you better read this first! You’ll be doing a LOT of work! Staying somewhere and worried about bed bugs? Check here. Do not use canned sprays! They act as repellents and can cause bugs to travel to other areas not being treated. If you want to kill them, then follow the instructions on this website. It will take time, but in the end, it works! I know it feels like you will not make it through, but trust me, if you keep at it and be persistent you can kill them them. It is a great solution! One month total to eliminate a medium bed bug infestation – well worth the time! Bat Bugs or Bed Bugs? © 2008-2019 BadBedBugs.com · No information on this site should be construed as medical advice · We make no guarantees, what worked for someone else may not work for you.